The very first cell phone call was made on April 3, 1973 by Martin Cooper. While working for Motorola, he led the team that developed the innovative technology. There were earlier types of mobile phones, though Cooper’s invention was the first to utilize “cellular technology,” and it began the mobile revolution that has transformed almost every aspect of modern society. In 2007, Time magazine named him one of the top 100 inventors in history. 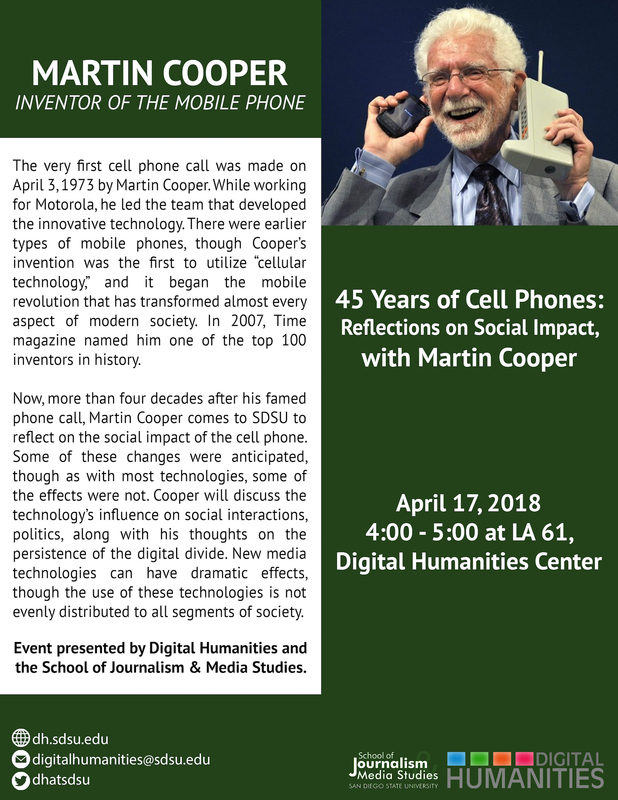 Now, more than four decades after his famed phone call, Martin Cooper comes to San Diego State University to reflect on the social impact of the cell phone. Some of these changes were anticipated, though as with most technologies, some of the effects were not. Cooper will discuss the technology’s influence on social interactions, politics, along with his thoughts on the persistence of the digital divide. New media technologies can have dramatic effects, though the use of these technologies is not even distributed to all segments of society. Presented by the SDSU Digital Humanities Initiative and the School of Journalism & Media Studies.